Impressive performance, a plush cabin, and an elegant exterior look are among the many reasons for the BMW X5’s survival in the hyper-competitive midsize luxury SUV segment. The 2017 BMW X5 offers an extensive array of options, drivelines, and powertrains, and handles better than most of its powerful rivals. The 2017 BMW X5 comfortably holds five passengers, but an optional third-row seat increases the seating capacity to seven. Like most vehicles in its class, the optional third row is not roomy enough for taller passengers. However, children will have almost no problem fitting in the available space and being comfortable on longer drives. For 2017 the BMW X5 adds a wireless charging pad and a Wi-Fi hotspot feature to the Premium package on 35d, 35i, and 40e trims as well as to the Executive package on the 50i model. Its iDrive infotainment system is updated to version 5.0, and new trim, paint, and wheel options. The Luxury package (initially known as the Luxury Line) is a no-charge alternative to the xLine for 2017. The 2017 BMW X5 is sold in four trim levels: 35i, 35d, 40e, and 50i. All but the 35i model get the BMW’s all-wheel drive (xDrive) system that comes incorporated with a rear-wheel drive (sDrive) system. There is also an optional performance-oriented X5 M variant that is often treated as a separate model. The available Luxury, xLine and M Sport equipment lines offer different color schemes, wheel designs, upholstery types, and trims. The M Sports model is fitted with shift paddles and sport front seats. There are also three other bundle options: the premium package, Luxury Seating package, and the Cold Weather package. The Premium is an option for all but the 50i and includes leather upholstery, keyless ignition and entry, satellite radio, a wireless charging pad, a Wi-Fi hot spot, and four-zone climate control. The Luxury Seating package adds ventilated seats and multi-contour front seats while the Cold Weather package includes heated rear seats and steering wheel. xDrive models benefit from the Dynamic Handling package that brings a body-roll mitigation feature and an enhanced AWD system. Lastly, the Lighting Package provides upgraded automatic high-beam headlight control and adaptive LED headlights. A sportier adaptive M suspension and second-row comfort seats are, however, not availed to the 40e. Drivers can also opt for soft-close automatic doors, automated parking assistance, upgraded interior trim and leather upholstery, manual sunshades, and smartphone app integration. To keep rear passengers occupied, the new BMW X5 can be fitted with a rear-seat entertainment system, and just in case more boom is required then an optional deluxe Bang & Olufsen audio system would be ideal. The 2017 BMW X5’s price ranges from about $56,000 (X5 sDrive35i) to a little below $100,000 (X5 M). 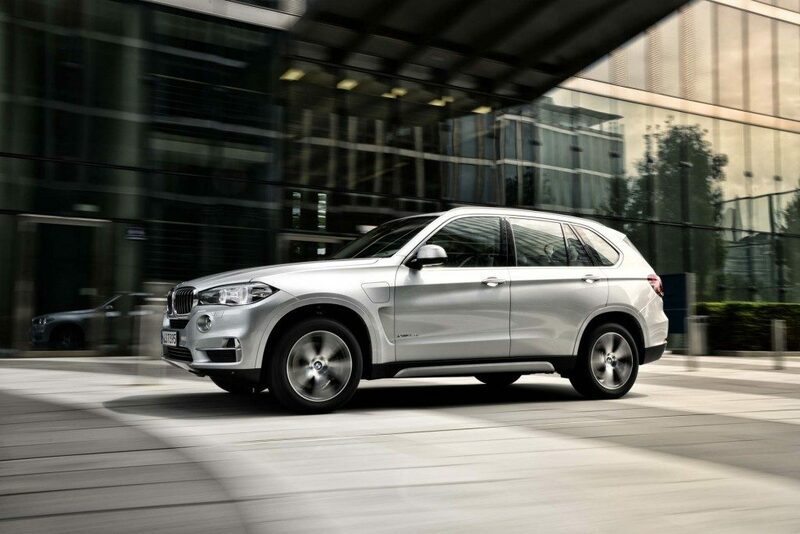 The latest BMW X5 looks and feels modern without losing the BMW demeanor. As usual, the cabin abounds with high-quality materials fitted with an excellent level of craftsmanship. Even the standard seats are adequately cushioned and well shaped for long-distance driving while stepping up to the available 16-way Multi-contour seats provides ultimate comfort. The legroom on the second row is less than on the first row, but not so much as to feel cramped. Its third row is not the roomiest in its class but offers enough space for children and shorter adults. It will not take long for the driver to get acclimated to the logically placed dials, controls, and gauges. The menus on the infotainment interface also become second nature with time and the handwriting-enabled touchpad makes it even easier to operate it. The 2017 BMW X5 provides some of the most competitive cargo capacities in its class. It offers 35.8 cubic feet behind the second row and a class-topping 76.7 cubic feet with the rear seats folded. The xDrive40e’s battery pack decreases that volume to 34.2 and 72.5 cu ft, respectively. The X5 also includes a two-section power liftgate that is fitted with a fold-down lower section to ease loading and to provide a place to sit for tailgating. The X5’s cabin is home to a plethora of tech features including Bluetooth phone and streaming audio, BMW Assist emergency telematics, BMW’s iDrive technology interface, voice controls, an HD radio, USB and auxiliary audio inputs, a 10.2-inch central interface, and real-time navigation system. Buyers can also go for premium vinyl upholstery, a power tilt-and-telescoping steering wheel, 40/20/40-split folding rear seats, and 14-way power adjustable front seats. The 2017 BMW X5 35i model carries a 300-hp 3.0-liter turbocharged inline six-cylinder engine that delivers 300 lb-ft of torque. It is joined to an eight-speed automatic transmission that powers all wheels on the xDrive models and rear wheels on the sDrive models. EPA estimates ranks the 35i at 21 mpg combined (18 city/25 highway) and 20 mpg combined (18 city/24 highway) for the sDrive and xDrive respectively. In Edmunds testing, an X5 xDrive35i made a zero to 60 mph bolt in only 6.1 seconds. Powering the xDrive35d is a 255-hp turbodiesel inline-6 that returns 413 lb-ft of torque. Fuel estimates are yet to be released, but they are expected to be higher than those of the 35i. The BMW X5 xDrive40e plug-in hybrid is driven by a combination of an electric motor powered by a 9-kWh battery pack and a 2.0-liter four-cylinder engine to spit out 308 hp and 332 lb-ft of torque. The hybrid is expected to return 14 miles of electric-only propulsion and to make it to 60 mph in 6.5 seconds. EPA ranks it at 24 mpg combined on gas and 56 mpg equivalent in gas/electric mode. A turbocharged 4.4-liter V8 engine in the xDrive50i makes 445 hp and 480 lb-ft of torque. Fuel economy is estimated at 17 mpg combined (15 city/21 highway), and BMW claims that it makes a sprint from zero to 60 mph in 4.9 seconds. Safety features include antilock brakes, stability and traction control, active head restraints, a surround airbag system, and automatic brake drying, among others. The Driver Assistance package gives a head-up display and a rearview camera to the 35i and 35d models. It is a prerequisite for the Driver Assistance Plus package that includes a surround-view camera, adaptive cruise control, and a set of advanced safety features. The NHTSA gave the current BMW its top score of “Good” for side-impact crash tests and the moderate-overlap front-impact tests. The agency also awarded it a top “Superior” rating its optional forward collision mitigation feature. There is plenty of power to drive the 2017 BMW X5, regardless of engine choice. The ride quality is commendable thanks to its excellent handling. The standard wheel and tire combinations provide the smoothest rides. Although outside noises are more prevalent than one would expect from a vehicle of its status, they are rarely intrusive. The xDrive35d’s diesel powerplant is a favorite among many reviewers because of its combination of powerful performance and admirable fuel economy. Thinking of buying a BMW X5? Already own one? Leave a comment and let us know what you think!